Probably the pinnacle of UK rap. Now the grandfather but then the hardworking leader of the UK scene. Too many good tracks on this release. 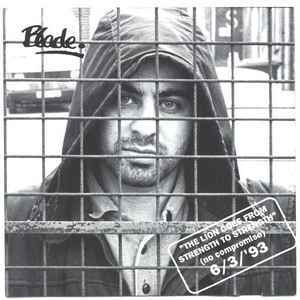 Shame that Lyrical Maniac doesn't appear in full, but, that's Blades sense of humour. Gritty and relevant to the early 90's. Still relevant today. Blade's debut LP is ambitious, long, funny, hard and everything inbetween. A visionary as usual. it was a brave self believing MC that would ask the fans for funding to record the album. And now what are artists doing 20+ years later? the same thing with sites like Kickstarter etc. Ambitious, but pulled it off. Increasingly becoming one of my favourite albums. I love Dark and Sinister, MC Mell'O' is superb when he gets angry.